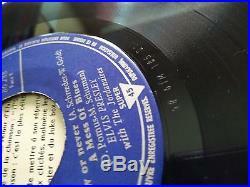 I'M VERY HAPPY TO PRESENT TO ALL ELVIS PRESLEY COLLECTORS ONE OF A KIND RECORD TO YOUR COLLECTION, I WAS CLEANING THE RECORD AND START TO PLAY AND I WAS LISTENING AND THEN SOMETHING WAS WRONG THE SONGS WERE NOT FROM THE SLEEVE I TOUGHT THE RECORD WAS CHANGED FROM SLEEVES, BUT I LOOK THE LABELS AND I SAW THAT WAS PRESSED THE SONGS FROM THE SLEEVE, I SAW THE MATRIX NUMBERS THEN I REALIZE THAT WAS A BIG MISPRESSED EDITION, SOMEONE ON THE FACTORY MAKE A BIG MISTAKE AT THE TIME, SO NOW YOU HAVE A SLEEVE AND LABELS FROM THE EP "IT'S NOW OR NEVER" 86.288, BUT THE SONGS PRESSED ON VINYL ARE FROM THE EP "SURRENDER" 86.303 AND THE MATRIX NºS ARE. 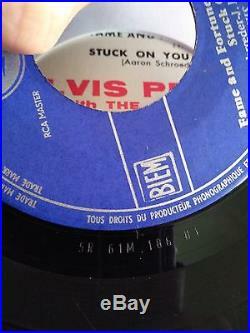 Matrix / Runout (Stamped side A): 5 R 61M 185 01. 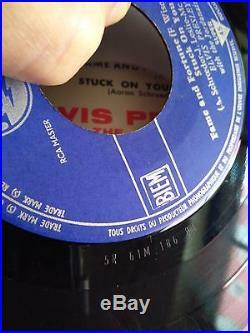 Matrix / Runout (Stamped side B): 5 R 61M 186 01. AND THE SONGS PRESSED ON VINYL INSTEAD OF. IT'S NOW OR NEVER YOU HAVE SURRENDER. A MESS OF BLUES YOU HAVE LONELY MAN. FAME AND FORTUNE YOU HAVE FLAMING STAR. STUCK ON YOU YOU HAVE SUMMER KISSES WINTER TEARS. 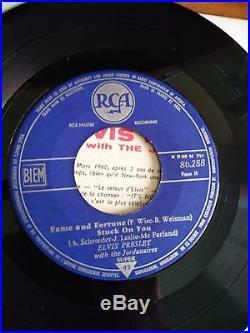 SO I LET YOU DECIDE THE VALUE OF THIS UNIQUE RECORD MAKE AN OFFER, YOU HAVE A AUTOMATIC PRICE OFFER IN THIS ITEM THAT I ACCEPT RIGHT AWAY, THANKS AND REGARDS. 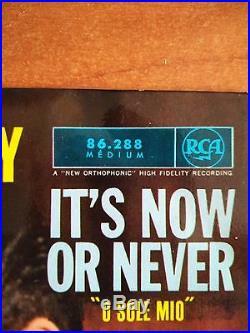 COVER SLEEVE CONDITION:G+ TO VG (SOME WEAR, 3 LITTLE TEARS WHERE THERECORD ENTERS ON SLEEVE). (also watch the pictures, if you can't see it send message). 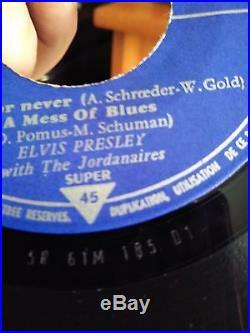 VINYL CONDITION:GOOD+ TO VG (SOME LIGHT MARKS, PLAYS VERY WELL, ONLY ON TRACK 2 SIBE B YOU HAVE A LITTLE JUMP). Attention, i clean the cover sleeves and vinyl, the best i can, without damaging, i try to get all the dust, dirt, writings, try to fix some imperfections when they need it, when you see the record is the best i could do, i clean the vinyl superficially only to get dust, maybe some records with best cleaning sounds better, i hope you understand, i have to many records every week to check out, any questions, please ask. 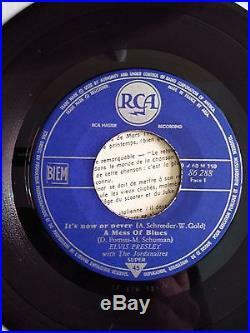 WATCH MY OTHER RECORDS, MAYBE COULD INTERESTED YOU. 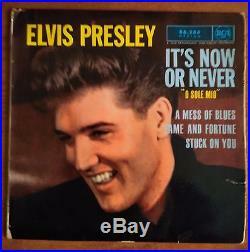 The item "ELVIS PRESLEY FRENCH EP MISPRESSED SONGS RAREST SURRENDER IN IT'S NOW OR NEVER" is in sale since Thursday, March 30, 2017. 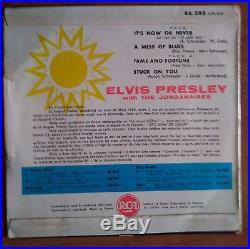 This item is in the category "Music\Records".johnny70" and is located in AMOREIRA.